It’s hard to believe it’s time for school again! Where did summer go? Gone are the days of lazy mornings, free schedules and poolside lounging. The daily grind is back and Gwinnett Family Dental Care is here to help you survive the back to school rush. If you have a student involved (or hoping to be involved) in sports this year, let Gwinnett Family Dental Care help you protect her precious teeth. We offer custom sports mouthguards for protection and comfort. Store bought mouthguards are not the optimal choice in mouthguards. They can compromise optimal breathing, be ill fitting, and inhibit verbal communication. 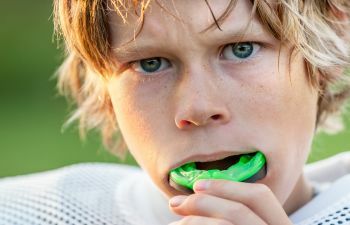 Chewing on a mouthguard is not ideal and can actually harm it. But, it’s good for your budding super star athlete to realize that even the professionals know the value of protecting their pearly whites while on the field or court. Gwinnett Family Dental Care offers dental software and advanced in-office technology to fabricate your sporty student’s mouthguard. It will fit over every crevice and groove of the teeth for optimal comfort and protection. Call and book your appointment today!